OCTOBER 2-13 – The sketches have been drafted and the building materials chosen, for Friends of the National Parks Foundation’s (FNPF) new headquarters on Bali’s Nusa Penida island. 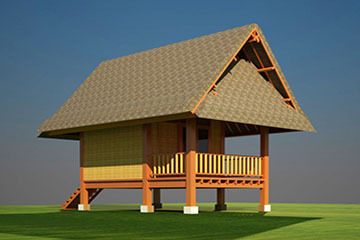 An artist's impression of one of the accommodation buildings in our new community and volunteer conservation center on Nusa Penida island, Bali. “Recently, with backing from a few long term individual donors, we purchased an acre of land in Ped village, just few hundred meters from our current base. We are hoping to start building on our new conservation and volunteer base here either later this year or early next year,” says FNPF CEO and Founder Dr Bayu Wirayudha. The site will be the hub of operations, from where we will run our conservation projects and establish a community learning center. It will also provide accommodation for the hundreds of volunteers who come from all over the world to assist us each year. FNPF has been working on Nusa Penida since 2004. Eight years ago we set up the Bali Bird Sanctuary, the only one of its kind in Indonesia, on the island. The sanctuary provides a haven for Indonesia’s rare birds: the country that has the world’s second-highest number of endangered birds. 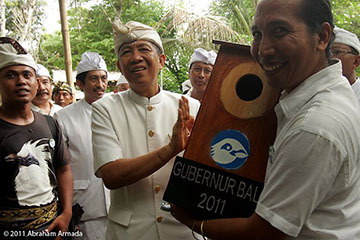 We have released many Bali starlings, a critically endangered bird, into the wild on Nusa Penida. Here Dr Bayu Wirayudha (right), our CEO and Founder, holds a bird nest box at one such release. Within the sanctuary we rehabilitate and release ex-captive endemic birds, run reforestation and community development projects, and are also establishing a refuge for sea turtles. The Bali Bird Sanctuary has the backing of the islands’ 46 traditional villages and it is estimated Nusa Penida, and two small neighboring islands, is today home to more than 100 Bali starlings, one of world’s most threatened birds. “We want to expand our conservation programs on Nusa Penida, but sadly we’ve outgrown our current rented center, which has been our headquarters for almost 10 years. We are really in need of a new base where we can grow and build on our successes so far,” says Dr Wirayudha. FNPF has a number of new projects planned for the centre, including setting up on site a commercial organic and herb farm, and a model sustainable green business the proceeds from which will be poured back into funding the conservation projects we run on Nusa Penida. Currently our work on Nusa Penida is primarily funded through our volunteer program. Added income from the farming projects and model green business would help ensure our work is entirely self-sustainable in the future. The planned farming project will also be a teaching tool, used to show local community successful and sustainable environmentally-friendly ways they too can make a living. 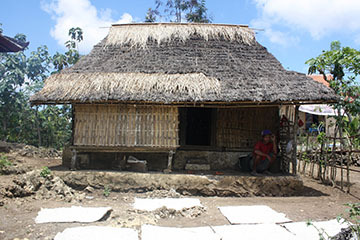 This house has been built using Nusa Penida's traditional building practices and materials. The look of our new center is based on this sort of design. It is estimated construction, including landscape and creating road access, of the center will cost just under US$43,000. If you can help email us at info@fnpf.org. The center will include six twin rooms, two dormitories, a kitchen, dining room, bathrooms, a community hall, a community library and office. We plan to install and use solar and wind power to run the facility. We plan to build the center adapting Nusa Penida’s traditional building techniques – to help preserve local heritage, which is under threat as new developments come to the island. We also intend to use as many local and sustainable building materials as possible.